Mid Wales includes the counties of Cardiganshire and Powys, a fertile rich landscape bordered in the west by the sweeping golden sands of Cardigan Bay. Cardiganshire location along the bracing west coast, is greatly enjoyed by yachtsmen. The county town of Cardigan was home to the first ever Eisteddfod, held in 1176. Powys is the largest county in wales, covering a quarter of its land mass. It comprises the old counties of Montgomery, Radnor and Brecon, which stretch along the heart of mid Wales, bordering with the English counties of Shropshire and Herefordshire. Its inspiring landscape is home to some fabulous natural wonders from cascading waterfalls to the Brecon Beacon National Park, attracting nearly 4 million visitors each year. The area is a walker's paradise. The geography of mid Wales is a mainly rugged and remote landscape containing some of the country's most magnificent scenery and wildlife. Its main industries are agriculture, hill farming and tourism. 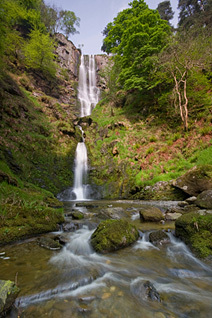 One of the most spectacular sights in mid Wales is the Pistyll Rhaeadr waterfall. Its 240 ft (80 m) drop makes it the tallest in Britain - which is actually 60 ft taller than the great Niagara Falls in Ontario Canada. This enchanting natural phenomenon nestles in the Berwyn Mountains, in north Powys. Anyone who visits would agree that this truly is a place of outstanding natural beauty and it has inspired some of England's most creative writers, such as J.R.R. Tolkien. Welsh Cakes - small scones filed with sultanas. Welsh Cawl - a traditional mutton/lamb broth or soup. First recorded in 991, Cardigan is based on the Welsh term Ceredigion, meaning territory of Ceredig, a dark-age Prince. 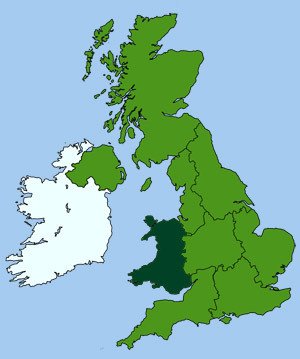 Powys means territory of the dwellers in the open country.